New Britain's AA Eastern League franchise had a new name in November 1994 and soon would have a new stadium. Assistant general manager Steve Archibald had his own vision for both the new field and the new Rock Cats mascot, according to The Associated Press. "What I picture in the new stadium," Archibald told The AP, "is a mascot running around playing a guitar with the lyrics from Elvis Presley's songs: 'One for the money, two for the show, three to get ready, now go 'Cats go,'"
Archibald served as business manager for the club and then assistant general manager, staying with the club into 1996. 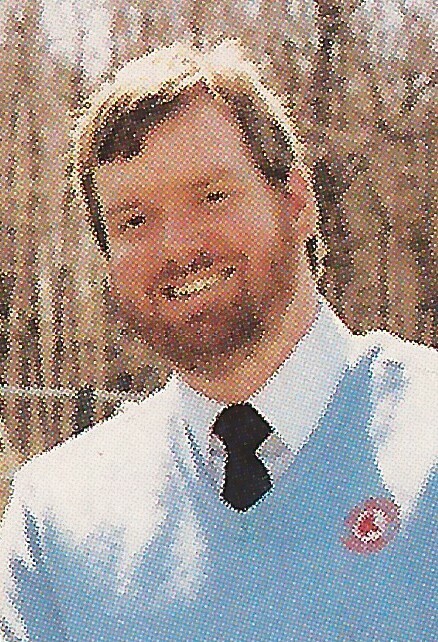 Archibald's time in baseball began by 1990, serving that year as the club's business manager. He returned in that role for 1991. By 1994, he'd moved up to assistant general manager and he worked to get the New Britain club a new stadium. He worked that May to help get the club a state grant. That August, he got a reminder to pay attention to the field, hit by a foul ball at the AA All-Star Game. "I was sitting down at a picnic table," Archibald told reporters. "All of a sudden I heard a loud crack and it felt like my head exploded." Archibald returned and he saw the New Britain club stay in the city and become the Rock Cats. He then continued as assistant general manager into 1996, when he left mid-season. 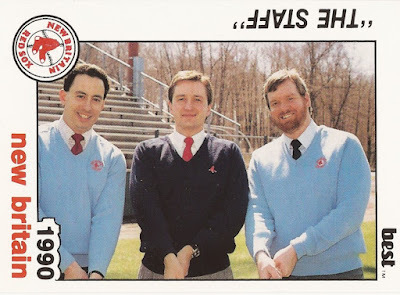 Note: The New Britain Red Sox "The Staff" card includes no identifying information, however form from left to right is general manager Gerry Berthiaume, assistant general manager John Kameisha and business manager Steve Archibald. Berthiaume kindly identified each after a Greatest 21 Days email inquiry.